Let’s begin at the end, but without giving away spoilers... so forgive the necessary vagueness. A character who’s been a constant through Peter F Hamilton’s Void sequence begins a new journey. This is both a surprise and yet entirely appropriate, in some sense the only way a trilogy that runs well past 2,000 pages could have ended. Click, things slot into place. Much the same might be said of Hamilton’s career. If his early books - even the much-feted Night’s Dawn Trilogy - sometimes had uneven moments when the plotting seemed forced, the fiftysomething Hamilton is in the midst of his imperial phase, when he’s simply the best at doing what he does. Think the Stones circa the early ‘70s for an analogy, although with rather less heroin and shagging. As for what he does, it’s still widescreen space opera, which is a little like calling Mick, Keef and co a blues band: factually accurate, but only part of what’s important. No, what really sets Hamilton apart is the way he juggles different storylines, themes and characters, shifting perspectives without ever losing sight of his main story. In the case of The Evolutionary Void , that means he’s juxtaposing ideas about how true post-corporeal life might come about with a narrative that riffs off epic fantasy clichés, while at the same time showing us strange alien tech and such memorable characters as Paula Myo, a plod so single-minded in search of her prey that she makes the Terminator seem unfocused. And throughout, there’s the Void that lies at the heart of the galaxy, a singularity threatening to wipe out life as everyone knows it. In balancing these elements, Hamilton creates truly epic science fiction that nods both to classic space opera and contemporary SF. 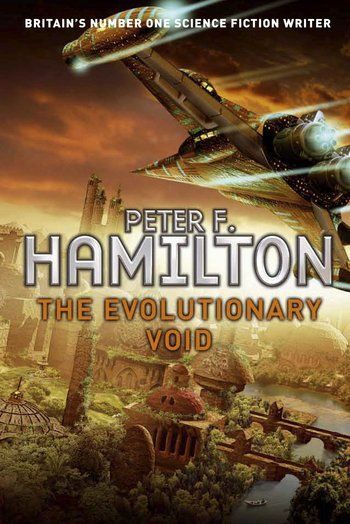 It’s a magnificent achievement that, not for the first time, has you thinking that 18 months is an awfully long time to wait for the next Peter F Hamilton novel.